The findings confirm archeological data, which shows that the slowdown in the spreading of farming communities was not, as often assumed, the result of crops needing to adapt to chillier climates, but indeed a consequence of the struggle for space with prevalent hunter-gatherer communities. In the future, the researchers' model could be used for further physical modeling of socioeconomic transitions in the history of humanity. As the researchers write, "The model presented in this work could be applied to many examples of invasion fronts in which the indigenous population and the invasive one compete for space in a single biological niche, both in natural habitats and in microbiological assays." Abstract. 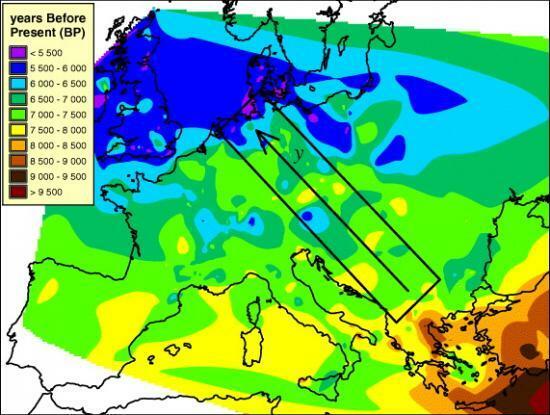 The front speed of the Neolithic (farmer) spread in Europe decreased as it reached Northern latitudes, where the Mesolithic (hunter-gatherer) population density was higher. Here, we describe a reaction–diffusion model with (i) an anisotropic dispersion kernel depending on the Mesolithic population density gradient and (ii) a modified population growth equation. Both effects are related to the space available for the Neolithic population. The model is able to explain the slowdown of the Neolithic front as observed from archaeological data. Chronology of the Neolithic wave of advance in Europe. Map obtained by interpolation of 765 early Neolithic data published by Pinhasi. The arrow corresponds to the y-direction in our model.